Limpias is a small village of only 1,200 residents located in the region of Cantabria, northern Spain. At one time it was even more famous than Lourdes following a series of apparitions in the 1920’s witnessed by thousands, involving the Crucifix of Jesus Christ in the Church of St Peter. Above the alter of the church is a life-size figure of Jesus on the Cross, and below on either side is the Virgin Mary and the Apostle John. It was made by the 16th century artist, Pedro de Mena, and was given to the church by Father Diego de la Piedra Secadura who was born in Limpias. The first miracle was witnessed by a Monk in 1914 whilst cleaning the figure. He suddenly noticed the eyes closing and they remained closed for five minutes. Initially it was dismissed, believing there must have been some sort of mechanism inside. But on closer examination it was confirmed the eyes could not be moved even when strong pressure was applied. Five years later in 1919 the same miracle happened again and was witnessed by an entire congregation. When the figure's eyes eventually opened again, he turned his gaze from side to side and began to perspire. These apparitions continued for the rest of the year, increasing in frequency and movement, including reports of seeing his lips moving and blood running down from the crown of thorns. Before long people began to flock to Limpias to see for themselves, from princes and politicians to bishops and cardinals. Limpias soon received more visitors than Lourdes with eight thousand testimonies from both believers and non-believers. The most powerful account was published by Dr. Penamaria who reported what he considered to be the re-enactment of Christ's death on the Cross. He described how Christ's eyes gazed up to heaven with a sad expression, his lips appearing to tremble and his breathing forced and laboured. His arms seemed to be trying to free themselves from the Cross with convulsive movements that accentuated the agony felt by the nails in his hands. As if struggling for air, his mouth and nose were opened wide, until eventually his head fell limp onto his chest as he expired. Incredibly, the apparition lasted for two whole hours. Although no apparitions have been seen since 1921, Limpias remains a very special place to come as people continue to pay homage to the Crucifix in St Peter's Church. It also offers a rather special experience when it comes to accommodation. 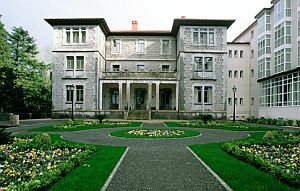 The Parador Limpias (Hotel Palacio de Equilior) is a 19th century palace that was converted into a luxury hotel. The palace was very important during King Alfonso XIII's era as this was where he held some of his ministerial meetings. It is surrounded by 5 hectares of parkland and the forests have actually been declared a World Heritage Site because of its important specimens including ancient Laurel trees. The hotel facilities include a gym, paddle tennis courts, seasonal outdoor swimming pool, and a restaurant that specializes in the local cuisine. Like the rest of Spain, Limpias also hosts several festivals throughout the year such as a parade of floats made entirely of flowers which is held in August, and in September they honour the patron saint of Cantabria, La Bien Aparecida. There are also several wonderful places to visit that would make ideal day trips. To the southeast and only 45 minutes away is the city of Bilbao which is surrounded by forest and mountains. The main attraction is the Guggenheim Museum of Modern Art where even the building itself is a work of art. Exhibits include artists such as Picasso and Andy Worhol. The art culture is reflected throughout the whole city though with interesting sculptures decorating the parks. Their largest festival in is August which includes open air concerns, bull fights and fireworks. The town of Santona is another great place to visit, especially if you feel like spending some time on the beach. Only 15 minutes away directly north of Limpias it is located right on the coast of the Mediterranean. The centre of Santona is built on the plain at sea level, whereas the rest of the town filters up the mountain slopes in the background. The beaches are located in the centre near the promenade, and if you are there in August you will also be able to take in their summer Carnival. The two main attractions of historical interest are the Monastery of Santa Maria and the Santa Maria de Puerto church. This 13th century church was apparently founded by the apostle Saint James, and houses several Flemish paintings. There are also two forts that are still in very good condition; the San Martin and San Carlos. Finally directly south of Limpias is Ampuero, a small provincial town filled with architectural interest and an extraordinary number of restaurants in comparison to its size, each offering excellent cuisine. Although the traditional dishes are mainly made with fish or meat, Ampuero's best known for its eel dishes. This is a wonderful region to explore and if you enjoy a more intimate location Limpias can offer that and more, with a unique opportunity to stay in a 19th century Palace, the Parador Limpias and a chance to visit the infamous Crucifix of Jesus Christ.